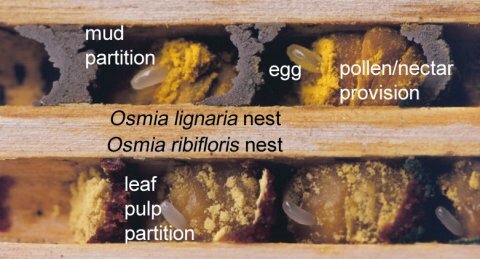 The Blue Orchard Mason Bee, technically known as Osmia lignaria, is truly a gardener’s best friend. One of Nature’s best pollinators, each one is able to do the pollinating work of 120 honeybees! And mason bees are active in cooler weather than honeybees so they are better pollinators of early blooming trees like apricots and peaches. What better way to improve production of delicious home grown veggies and fruit? How do you introduce mason bees into your garden? Mason bees will normally emerge from their cells in early spring, usually in April depending on location. They mate soon after coming out of the tube and immediately begin their search for pollen and nectar. The females will also begin looking for a new home. If she finds a tube or beetle boring that has previously been used, she will first clean it out. If she finds a nester tube, she will use it immediately. She will start by going to the back of the tube and laying an egg, depositing some pollen and nectar for food, and building a wall to create a cell. This wall building is why they are called Mason Bees. She repeats this process about 6 to 10 times, creating a cell for each egg. This activity usually continues through June, and then they will begin dying. But the eggs are now hatching and eating the food that was left for them. The larvae go through their entire cycle inside each individual cell, molting 4 to 5 times. Around August they will spin a cocoon and begin gradually developing into an adult Mason Bee. They will spend the fall and winter in their cocoons and emerge in early spring. 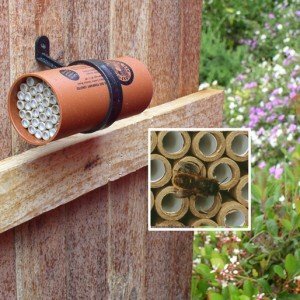 Mason Bees are often referred to as solitary bees because they do not have a social order like honey bees and bumble bees. They do not have a queen or a hive and they do not make honey. However, they are perfectly happy making a nest right next to each other. Mason Bees are such effective pollinators because they have a lot of hair on their body which picks up pollen. Unlike honeybees which clean themselves after each visit to a flower and store the pollen in sacs to carry back to the colony, the Mason Bees carry all of their pollen from flower to flower. Mason Bees tend not to sting because they are not a social bee and do not have a hive or a queen to protect. The only way to get one to sting is to squeeze it, and even then it probably won’t sting. 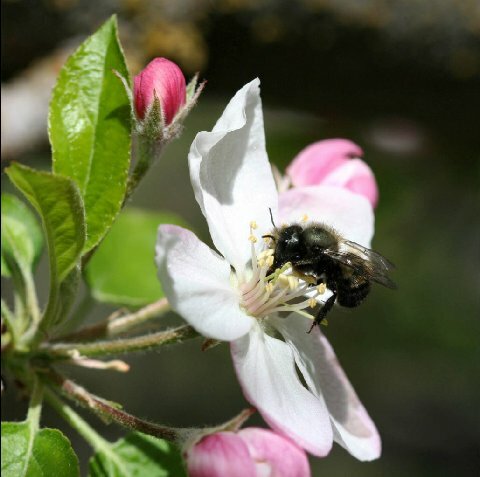 Mason Bees are active in colder temperatures than honey bees which makes them very effective in orchards pollinating fruit trees. 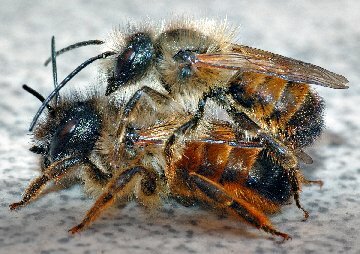 Fortunately Mason Bees are not susceptible to the Varroa mite which has caused such havoc with honey bees all over North America. So, try introducing some Mason Bees into your garden this spring. It’s easy. It’s fun. Your garden will love you for it.